Yesterday’s snow vanished in a day’s rain and the storm promised here for the afternoon never developed. So we’re dialing back on the octane level with the sole lager on our dazzling dozen list. Not to say this isn’t a warming potion at 5.6%, a wheat bock with added spices—an aromatic cinnamon blend called Saigon Cinnamon, orange zest and ginger. But it’s certainly more mainstream than our first two picks. 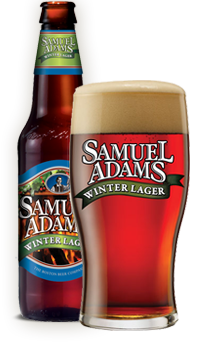 The spices are similar, if more subtle, to what can found in Old Fezziwig Ale, another brew from the Samuel Adams crew that could also have served our purposes here. But then so could have the Holiday Porter, the White Christmas or the Chocolate Bock, all part of the Winter Classics Variety Pack. It’s a curiosity to me that, until now, I’ve never reviewed one of brewery’s beers (other than adding Infinium to a 2010 Christmas six-pack). Maybe because of the sheer ubiquity of Samuel Adams products? 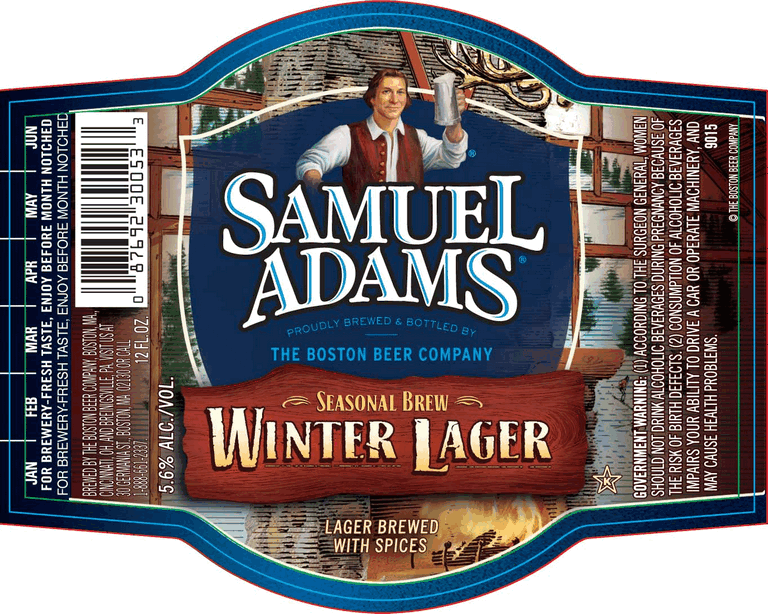 There’s the flagship Boston Lager, Sam Adams Light, and about 14 other year-round beers in the Brewmaster’s Collection, 20 seasonal brews, a Barrel Room Collection, an Imperial series, a Single Batch series, and then the off-the-charts brews like the 29% ABV Utopias. Drink one Samuel Adams product a week and you wouldn’t make it through the entire list in a year. But this one, actually a weizenbock, is as perennial as a Christmas cactus since its introduction in 1989. A clear, dark ruby pour releases some of the spicy aromatics, but barely, so those who shy away from spiced beers needn’t flinch. The caramel malt backbone is in the carriage driver’s seat here, as befits the style. The wheat malt may lighten the mouthfeel a tad, but this is still a chewy beer with a mild roasted quality, finished off crisply with Hallertau Mittelfrueh hops. As I say, not one to knock you off your barstool, but quite agreeable. It could work quite well with any portion of a meal, even dessert. Or, as dessert.